Did we perhaps meet at the World Haiku International Conference, 2002, held in Yuma Town, near Akita? I attended as part of the World Haiku Club. I enjoyed the area very much. It was September; but, the fall colors were not yet full. There were many red dragonflies, (akatonbo), as I recall. He really loves Japan and Haiku. 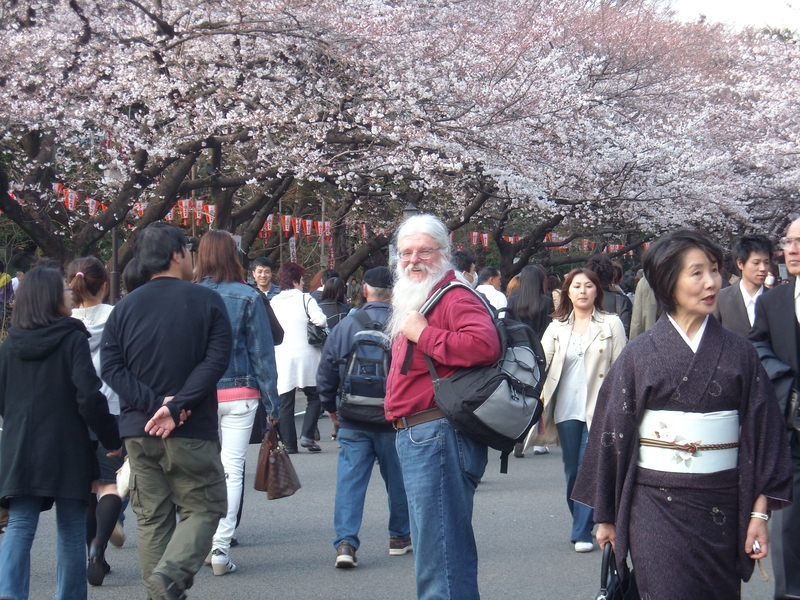 This is a photo which shows that he enjoyed the cherry blossoms in Japan. 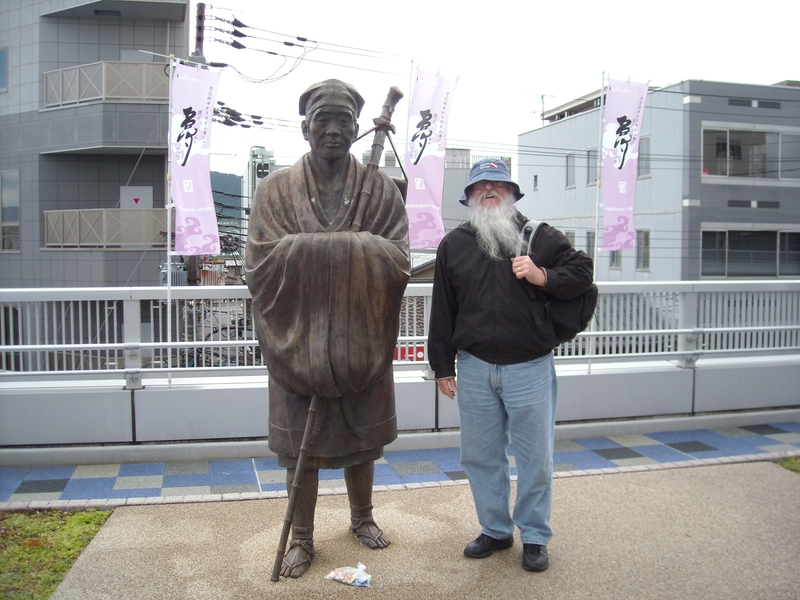 This is a photo taken with Matsuo Basho （松尾芭蕉）. As the homepage ‘HAIKU俳句’ by Yanagibori Etsuko（柳堀悦子） says , Mr. Holmes won first prize, Ninth Mainichi Haiku Grand Prix, English Haiku of International Section 2004. He is a member of ‘Haiku 俳句’. On July, 2004, Mr. Holmes contributed the following haiku to ‘HAIKU　俳句’. The members of ‘HAIKU俳句’ congratulated on his winning first prize in Tokyo. Thank you for your kind reply. As to my introduction, I am but a student of haiku, always. We live in Georgia, USA. Currently, we have temporary assignment on the Atlantic coast of Georgia, Saint Simons Island, USA. I write poems daily inspired by the ocean and the southeastern, USA. Renku is part of my current interests, and I am happy to say that Professor Shokan Tadashi Kondo, Seikei University, is a friend and my renku teacher. A Japanese friend and I compose juunichiou renku over the internet on the weekends. Some of the juunichiou have been aired on NHK Radio Japan’s program, World Interactive. I hope to be able to return to Japan to meet Dr. Gabi Greve, Okayama; Professor Kondo at Seikei University; Tokyo friends, and of course my Akita friends, again. 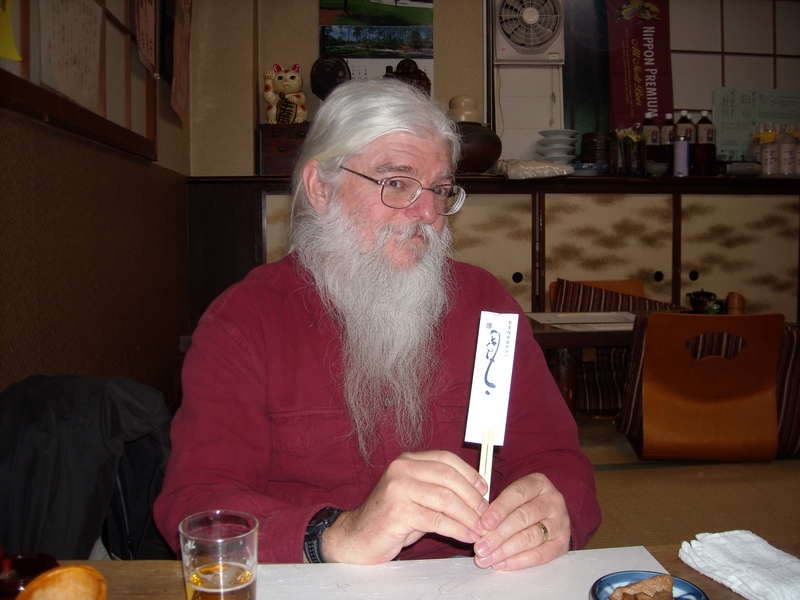 Mr. Holmes reads and writes Japanese, Hiragana（ひらがな：平仮名）and Kanji characters（漢字）. He writes and posts haiku on his Facebook page every day. Among haiku poets in USA, not only Mr. Holmes but also Cor van den Heuvel, Roberta Beary, Michael Dylan Welch, Curtis Dunlap, Charlotte Digregorio, Charles Bane Jr, Diane Dehler, Morgan Harlow, Roberta Burnett, Stevie Strang, J. Andrew Lockhart, George O Hawkins, are Facebook haiku friends of mine. I sincerely hope that you will be a Facebook friend, and that you will share and exchange poetic works with each other. I liked the haiku very much. “Following/the slope of hills/fields of flowers” is a splendid creation. I am always encouraged when more haiku poets are revealed. Thank you for sharing this post. I enjoyed his haiku and found him very interesting. Thank-you for bringing us the work of Dennis M. Holmes. I enjoyed it very much. Thank you. The comments were very encouraging. I love haiku.